Next week it's 'something on a stick day' - officially Saturday 28th March - and one day earlier En Brochette wil be serving up a very special supper club downstairs at the ad agency Mother, with lot of meats on lots of sticks. 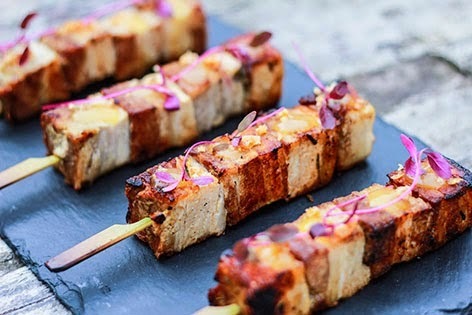 Tickets are £35 and include canapes, a cocktail, and then lots of courses of meat on sticks. Don't let this one pass you by! "Downstairs at Mother have invited us to take over their beautiful space in the heart of Shoreditch on the evening of Friday 27th March. For your ticket price, you shall be greeted with canapés & a cocktail, curated by our good friends at Soul Shakers. We will then invite you to your tables and you shall be served a feast, most of which will be on huge skewers in celebration of stuff on a stick day. There will definitely be something special from our repertoire of unusual meats. Delicious and reasonably priced grown-up drinks will be available on the night. The musical entertainment shall be thoughtfully curated by none other than Keith Mathews, who has developed a reputation for adding a certain amount of glamour to any evening. The best post on the night featuring the #keepitskewered hash tag will get a prize. Keep it skewered people, and hope to see you there!"